My summer cooking lab is up and running. Project number one, tweaking my pastry recipes for pies and crostatas. After a rainy June the summer berries have been plentiful, and now we are moving into apricots, peaches and plums…..
I’m not a big fan of whole grain pie crusts. Desserts are not something I indulge in every night and I want them to be decadent. Unbleached white flour is usually the best way to insure a light and delicate crust. On the other hand, I’m interested in how different flours can add to the flavor profile of the crust, offering, nutty, earthy notes. 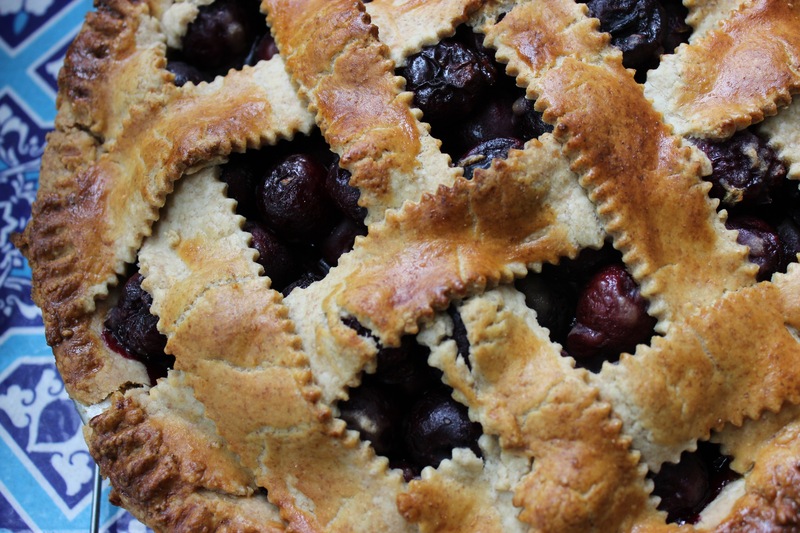 When I came across this rye pie crust recipe I was interested in the flavor and texture the rye flour would give, especially for berry pies which need a sturdier crust. The recipe also substitutes cold beer for the ice water, which means you must finish the remainder of the bottle while making the pie! For my filling I use cherries with a scant amount of chopped lavender and lemon zest. Lavender is a strong flavor so don’t overdo it. Berry pies do need a bit of flour tossed with the fruit so the juice thickens. Many pie filling recipes call for 1/2 cup, but I prefer a quarter cup, and for other fruit that does not give off as much juice, I sprinkle a small amount of flour on the bottom layer of pie crust. I don’t mind a bit of juicy juice with the pie, but if you want the filling more solid increase the amount of flour. The Rye Pie crust comes from 101 cookbooks, follow the link for more detailed instructions. You can make the crust using the quick and popular food processor technique. BUT I always make it by hand, using the above ingredients, and this technique. If you like a super-puffy crust, do the folding in Pim’s instructions 4x. I usually like mine less so, and fold & roll just 2 or 3 times, depending on how the dough is feeling. The pie in the photo was 3x.